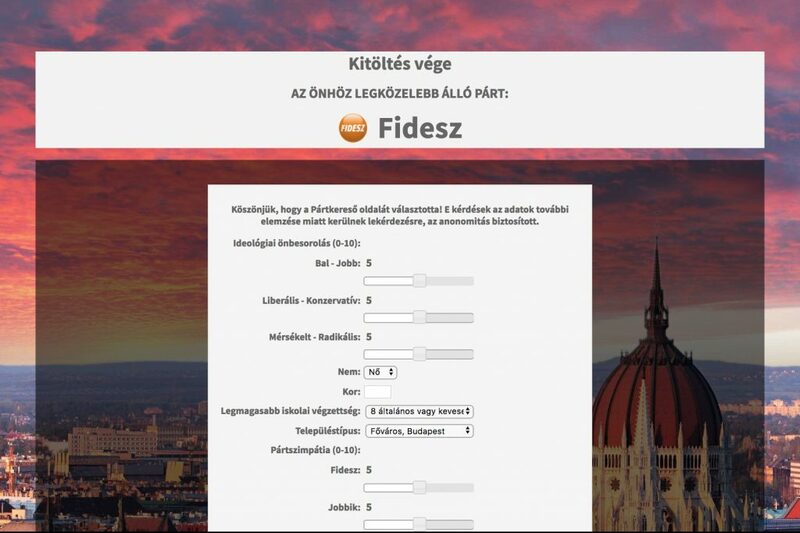 A politically loaded questionnaire evidently intended to persuade undecided and moderate voters to support the governing Fidesz-KDNP political alliance in the April 8 general election has hit the internet in the guise of a neutral opinion poll. The website is akin to a Greek fraternity house launching an “impartial” online dating service that inevitably ends up recommending members of that fraternity, regardless of what information is given by the user. Fidesz-tied public pollster Nézőpont Institute has launched a website called Party finder seeking to help voters to find the most appropriate party based on their views, reports index.hu. Experts say the 32-question survey is full of methodological errors, and instead of posing actual world-view-based questions measures a respondent’s acceptance of various government actions of the past eight years. The survey poses questions on four topics with eight questions per topic. Voters who seek to find out their ideal party have to decide whether they agree or disagree with statements about economics, society, immigration and government. At the end of the quiz, the website offers a party based on the answers and people can submit their ideological self-classification and party-preference on a voluntary basis. Those who filled out the quiz can check each party’s stance on all 32 questions. Oddly, if one chooses the neutral answer to all 32 questions, the website determines that Fidesz is the most suitable party for them. And this is not the only serious methodological error of the questionnaire. Many questions are worded in a way to suggest Fidesz’s standpoint as the preferable answer. On numerous occasions, the questions address but one side of complex problems. In other cases, the question is pointless since, according to Nézőpont, all parties agree on the issue. The quiz consciously avoids posing questions about issues that are awkward for the government, such as the state of public education and healthcare, or the increasingly pro-Russian foreign policy. Moreover, Nézőpont does not support its claims about the party preferences with sources. The website states that before its launch, the quiz was sent to all parties. However Democratic Coalition (DK), the Hungarian Socialist Party (MSZP), Dialogue for Hungary (PM), Politics Can Be Different (LMP) and Jobbik refused to answer, so “their stances were determined based on their respective party programs, statements by various leading politicians, and their presumable standpoints,” according to the pollster’s website. In its current state, the questionnaire is more of a poll about the second and third Orbán cabinet’s contested measures than real help for undecided voters.